If you're looking for a little wind and rain insurance, GoLite's four-ounce Ether Wind Jacket is about as light a shell as you can find. Toss the Ether in your day pack when the sun is shining, and you'll always have a jacket on hand if a sudden thunderstorm blows in—or if things just get a little colder than expected. Now with a full front zipper, the water-resistant Ether Wind Jacket is a DWR-treated nylon shell. The Ether thus derives its waterproofing from a chemical coating, rather than the fabric itself (such as GoreTex). DWR-coated nylon has the advantage of being highly breathable, making it an excellent choice for runners and climbers who tend to sweat. Of course, in a sustained downpour, coated fabrics do saturate over time, and repeated wear and tear eventually degrades the effectiveness of the water protection. The Ether is therefore by no means a substitute for a true waterproof shell on multi-day trips or whenever safety in foul weather is a concern. Many times, however, you just don't need a heavy waterproof shell. In the Sierra, for example, Spring and Summer rain is relatively rare (heck, toss in Fall, too). The Ether fits the bill nicely for day tours when the forecast looks good. As you'd expect from a shell this light, the fabric is very thin and unlikely to handle much abuse. 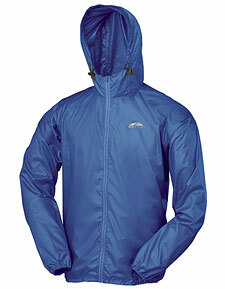 Compared to a good Gore-Tex shell, I certainly notice reduced effectiveness with regard to windproofness. This can be an issue even in clear weather if the air is cold and you're exposed to high winds. In any case, I would not recommend relying on an ultralight windshirt as a substitute for a hard shell in winter, or on a big peak (like Shasta) where sudden severe storms are a possibility. Be smart! Elastic cuffs and waist help keep the wind out and warmth in. Hood has draw cord to cinch down when things look really nasty, and, when you don't need it, the entire jacket stuffs into an internal pocket smaller than an energy bar. Use the GoLite Ether in appropriate conditions and you'll find it offers many of the same benefits as your hard shell, plus better breathability, at a tremendous savings in weight.